The summer that I spent working as an Arabic interpreter for Iraqi refugees in New Haven, Connecticut, my grandmother casually shared an anecdote from her youth. As a teenager in the years just after the Second World War, she, too, volunteered to interpret for refugees — Yiddish-speaking ones — as they were being processed upon their arrival in America. An American-born daughter of immigrants, her Yiddish often lacked the sophistication to relay information about the medical screenings and examinations facing her clients. When the doctors requested urine samples, for instance, my embarrassed adolescent grandmother could only manage to ask the refugees for a “glass of their water.” Confused, they diligently filled their cups at the water fountain and handed them back to her. That story has stayed vividly with me, and not just because it parallels my own experiences doing nearly identical work nearly seven decades later. There is something powerful in the image of my grandmother as a very young woman, offering her two native languages in the service of these strangers, many of whom must have been around her own age. As a young person, I sometimes find myself craving this evidence of past youth, especially as history tends to calcify memories and narratives. Recently, I have been particularly riveted by the newly digitized collection of Yiddish folk songs recorded in 1948 by Ben Stonehill in a New York hotel lobby, as well as by the Academy Award-winning Polish film Ida and its portrayal of two young, extremely complex Jewish women in post-war Poland. Then there’s the 1948 Yiddish film, אונדזערע קינדער (Our Children), in which the famed comedians Dzigan and Shumacher, tenderly but honestly interview Polish-Jewish orphans about their wartime experiences in order to learn how to present them on the stage to audiences who had undergone the same trauma. All of these documents preserve, or at least allow us to imagine, moments of deep humanity among those who had survived, but were not defined by, utterly inhumane circumstances. 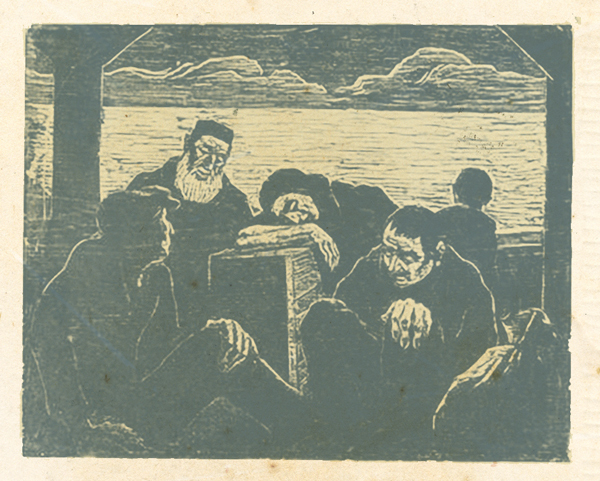 JACOB STEINHARDT (1887–1968), Refugees (1947), Woodcut. 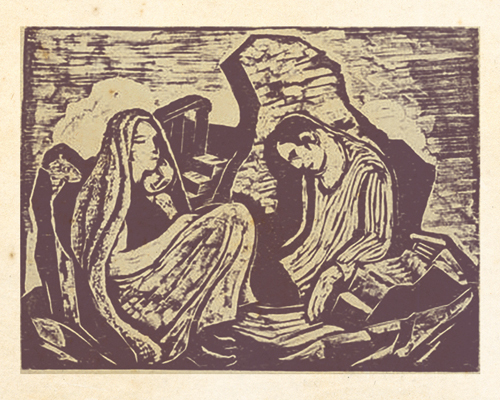 JACOB STEINHARDT, Refugees (1947), Woodcut. 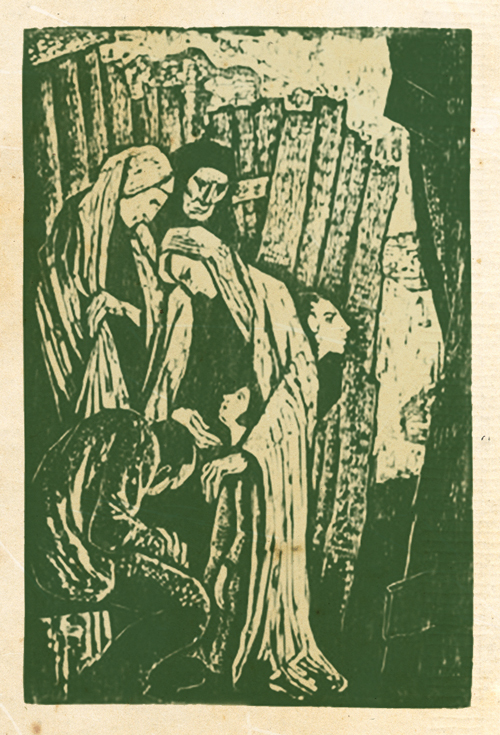 JACOB STEINHARDT, Refugee Family (1950), Woodcut. Growing up, I was told in Hebrew school that my generation would be the last to hear the firsthand testimonies of living Holocaust survivors. And though they had, for the most part, lived through World War II at an age not much older than ours, it was as wizened prophets that we were to remember them. 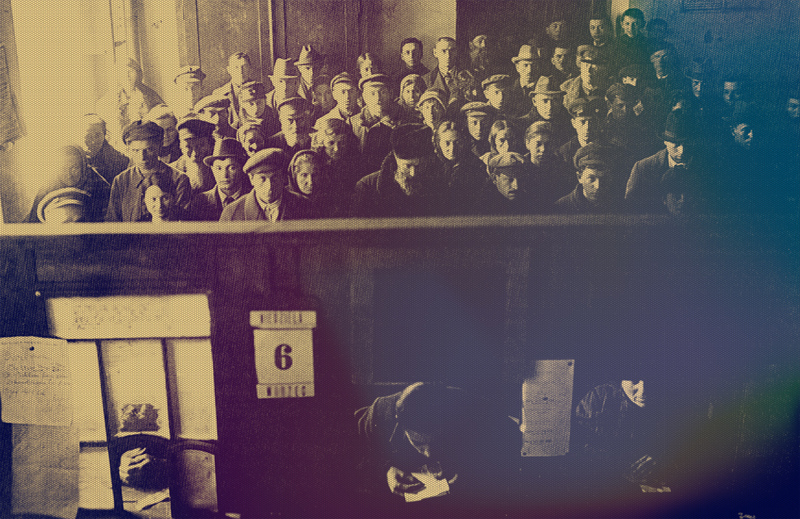 It is as elderly “Survivors” that their testimonies have been recorded and archived. Now their very likenesses are being turned into holograms by the organization charged with preserving this testimony so that future generations might have the “immersive, interactive 3D experience,” that I was lucky enough to witness in the flesh. As they sang to the wind blowing in off the Bosphorus, asking it to take them back to Syria, I reveled in the humanity of the moment, in the sometimes unbelievable coexistence of the joy of song and the physical and emotional trauma of war. Like many others in the crowd that night, and somewhat like Ben Stonehill at the Hotel Marseilles in 1948, I felt compelled to take out my phone to capture not just the music, but what it represented. These people, sleeping in the streets and finding shelter in the abandoned buildings of the city – are they migrants or are they refugees? Even in their own native Arabic there are multiple terms being used, from nāziḥ (closer to migrant) to lājiʼ (refugee), each with its own set of connotations. But in Yiddish there is no doubt: they are pleytem and, literally speaking, they are truly sheyres hapleyte, the living legacy of disaster. Whether in Syria or Jordan, Turkey, Hungary, or Germany, they are the ones who remain following the flight from their embattled homes, who continue to survive the uncertainties and humiliations of every day. In the summer of 2015, there were over one-third of a million Syrian refugees in Istanbul of the nearly two million in Turkey. Here a group of musicians plays the anthem — originally Palestinian, but now of all stateless people — Mawtini (My Homeland). While I don’t want to draw fruitless comparisons between World War II and modern-day conflicts, I can’t help but wonder whether some of these millions of dispossessed individuals will one day be graduated to that special lifelong status of “survivor” and that their testimonies and songs will be deemed deserving of posterity. But we don’t need to wait for history to make its own conclusions. We have our tongues, our pens, our cameras, our wallets, and our hearts with which to welcome, aid, and stem the human tide which has been flowing since well before the chronicles of the Amalekites.